They’re one of my favourite decadent treats–chocolate eclairs and creme brûlée being two others. 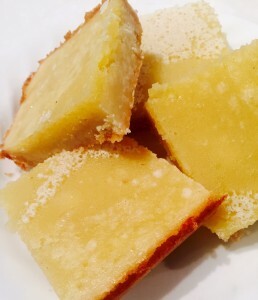 But while those are a bit time-consuming and fiddly to make, I recently discovered that, to the delight of my family and friends, Lemon Squares are very simple–just 5 ingredients! Enjoy this recipe. Preheat your oven to 350 degrees. In a mixing bowl, beat together the butter, 1/2 cup of the sugar, and 2 cups of the flour until texture resembles fine bread crumbs. Press this into the bottom of an ungreased 9″ x 13″ baking pan. Bake for about 20 minutes, or until edges are just starting to become lightly golden. Meantime, stir together the rest of the sugar and flour; whisk in the 4 eggs and the lemon juice. Pour mixture over the baked crust, and return the pan to the over for another 20 minutes. Allow to cool, and cut into squares.